Were you ever afraid of the dark? Maybe a bump in the night dragged you suddenly from deep slumber directly into panic? The unknown being fed by fantasy. What was that sound and where is it coming from kinda stuff. Maybe you turned on the lights. Or maybe you just lay there scanning the darkness, waiting to hear the strange sound one more time. Was there ever anything there? In full light its likely that everything was aok. The funny thing about dread as an after thought is that whatever made the moment so palpable and humbling is shelved as imagination run wild or, worse, logic categorizes it into a manageable container and compares it to the all-familiar. However, stay tuned-in my friend, there is a happening out there in the dark. I know constantly surveying surroundings is tiring and stressful. I had many of those nights as a kid. Nights where my attention was stretched so far from my bed that every little thing kept my attention pinging and sleep stayed away from me. Looking back, the fact that I tried to make sense of the unknown helped me. Staring out into the dark tuned me not only into the complexities of my thinking but also to a personal truth – paying attention pays off. I like the bumps in the night and the mystery that flows from them. And I have slowly started to stay with that itchy-tingly feeling of something really might be moving just beyond my POV. Changes in EDU definitely flow in this manner. A few weeks back I had a convo on my podcast Chasing Squirrels with Chad Reay about adding Google Home into his household. And I found myself equally fascinated and confused by the implications of this tech. Once in a while I notice a thing in EDU that has been sitting in my peripheral vision for some time. The obviousness of the thing is exactly what concealed it from view. Its almost like you have to get outside of that space to truly appreciate not only the thing in question, but also the difference between it and you, then and now, familiar and unfamiliar. A large part of the podcast was spent not only playing with Google Home right in the convo but also on the new tensions emerging between this bundle of joy as a piece of tech or as a member of the family. Eventually we made some headway into using voice assistant tech in classrooms but that topic was left open for next time. S’funny it wasn’t until just after the podcast that my language started to mess with my mind. The shift happened so slightly and profoundly that by the time I realized the power in Google’s branding strategy, embedded in this tech toy, I found myself very comfortably saying my friend now has a Google ‘home’. The IOT in classrooms is the new space we occupy everyday. Many posts on social espouse the ubiquitousness of a Google classroom and I appreciate the modernized tone of every one of those posts. Some dare to proclaim further that they inhabit a Google school. And this can seem like the ultimate double dog dare ya if you are still early in your adoption of edtech. So if your have edtech in your class, your communities are considered, SAMR is in your rearview mirror, and your current fluencies have shifted to include digi-cit standards of practice, and the footprint you make is coloured brightly with the tattoo you designed, and the constantly connected turbulences are easily managed by your modern learning ninja skills … I challenge you to take one more peek into the dark for a moment. Voice assistant tech is here and it is one permission form away from arriving in your show-and-share sessions during morning circle time. The thing that strikes me as the most impactful challenge is this; in order to maximize the IOT we gotta deal with pre-authorized accessibility and optimized interactivity. I mean whats the point of adopting an assistant that creates more work for you? Right? If it stays powered up, connected, listening, informed of your passwords, running-house, and integrated with your other personal data then it is purposefully existing … Right? This is a bump in the night worth paying attention to. Lastweek I binged Mozilla’s IRLPodcast https://t.co/1KiGzKVSUf Epi5 called out the varied ways we r all surveilled – from innocent2invasive&all insidious. A couple of my friends started using GoogleHome over theholidays. 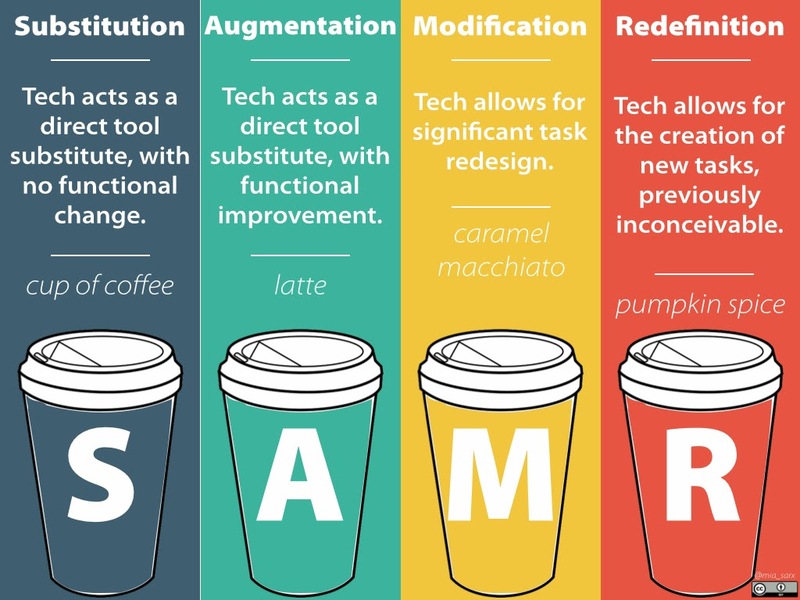 So I wonder is there space n ur SAMR journey for this tech?